We are registered for the bike tour a month challenge (hosted by Path Less Pedaled) and July was slipping away fast. We originally planned on a local tour from our home in Newberg down to Willamette Mission State Park for a one night, two day tour. Our plans quickly changed to the coast as the Willamette Valley was forecast to be over 100 degrees (F) during the day. The temperature dropped easily by 20 degrees as soon as we drove over the Coast Range. 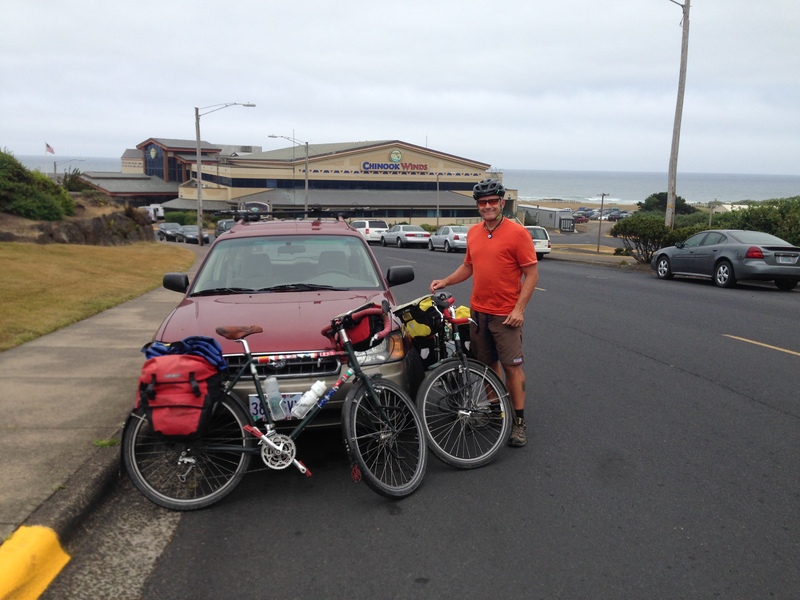 We found a safe place to leave the car just outside the Chinook Winds Casino in Lincoln City. 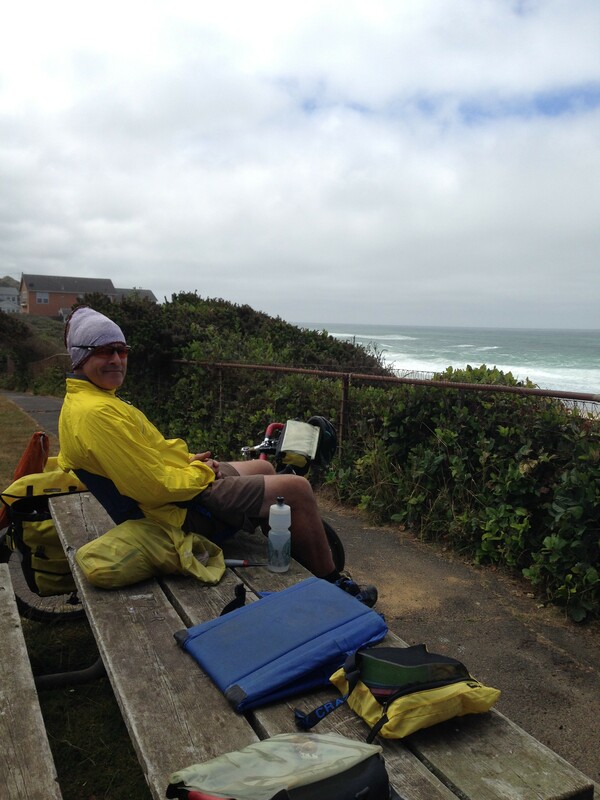 The ride from Lincoln City down to Newport was leisurely with a constant head wind (southerly) and the sun trying to break through the clouds. Many of the Oregon State Parks offer hiker/biker camp spots for $5 – $6/person (showers included) and they won’t turn you away – (as long as you are on foot or bicycle). 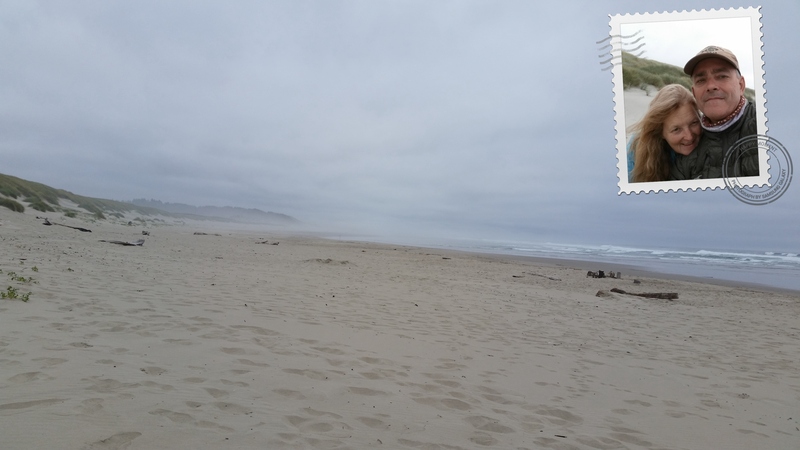 The South Beach State Park campground put us at just over 30 miles and two past the Newport Aquarium – which was on Janet’s wish list. 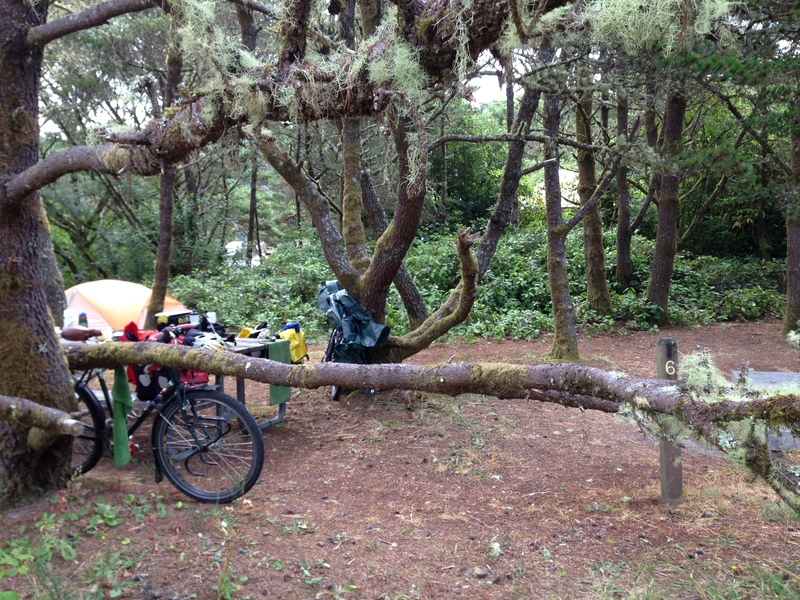 Our camp spot was nestled among the fir trees in the first-come-first served hiker biker spots. 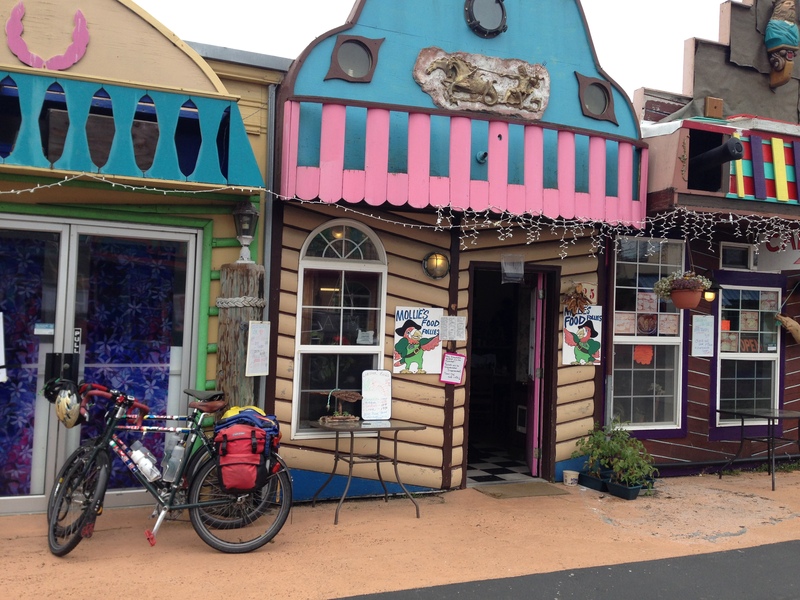 There were five other bike tourers sharing the area – it was strange, but awesome, to be among so many other bike tourists. During much of our year tour we were often the only bike tourists in a campground. There was also a strange dude who looked like he might have been living in the camp ground. His camp spot looked like a yard-sale with stuff everywhere. He had a white mesh laundry bag suspended from a tree with what looked to be a couple weeks of cloths smashed in like a sausage. There were at least three liters of mountain dew tucked into his vestibule along with several bottles of alcohol (Jim Beam?). We decided it was best to stay away from that side of camp. After a wander down to the beach, we settled in our tent for the night at 8 pm – and did not emerge until 8 am the next day – nothing like 12 hours of sleep to rejuvenate the body. 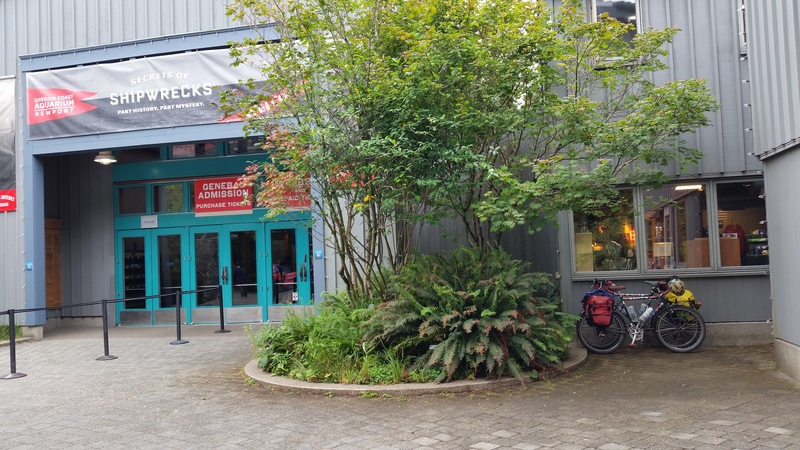 We finally got to see the Newport Aquarium on the way back. Arriving just after opening on a Monday morning, it was pleasantly uncrowded and all the critters were out to play. Janet wants to go back with a blank sketch pad and some color pencils and just spend the day drawing the beautiful sea life. The Aquarium visit, followed by second breakfast at Molly’s Food Follies in Aquarium Village, were definite highlights of our trip. We both enjoyed being back on the bikes. The moment we started pedaling away from the car we were reminded how comfortable we are out on our bikes. Our one year “world” tour went by so fast and we have been sucked up by home life – it is easy to forget how good life is on the road… how simple life can be. 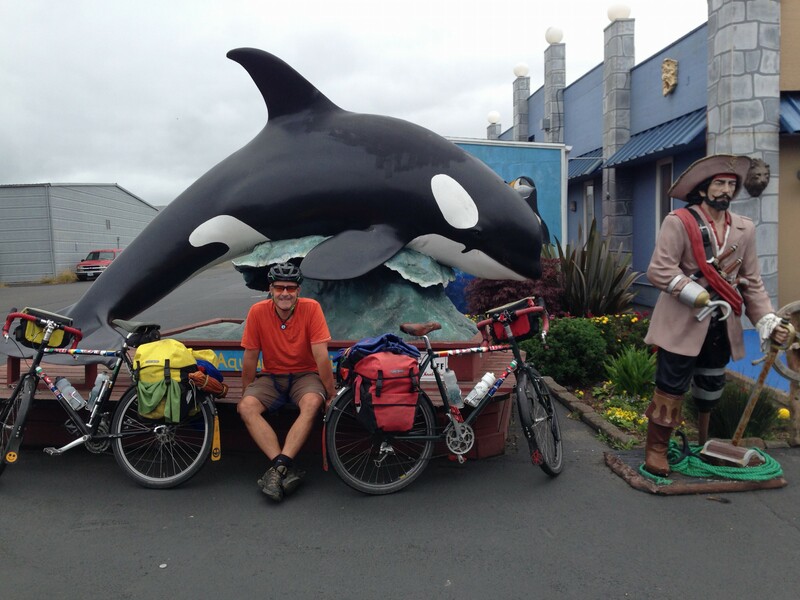 A big thanks to Path Less Pedaled for keeping the bike touring momentum going! Lunch at Gleneden Beach – yes we sit on top of picnic tables. 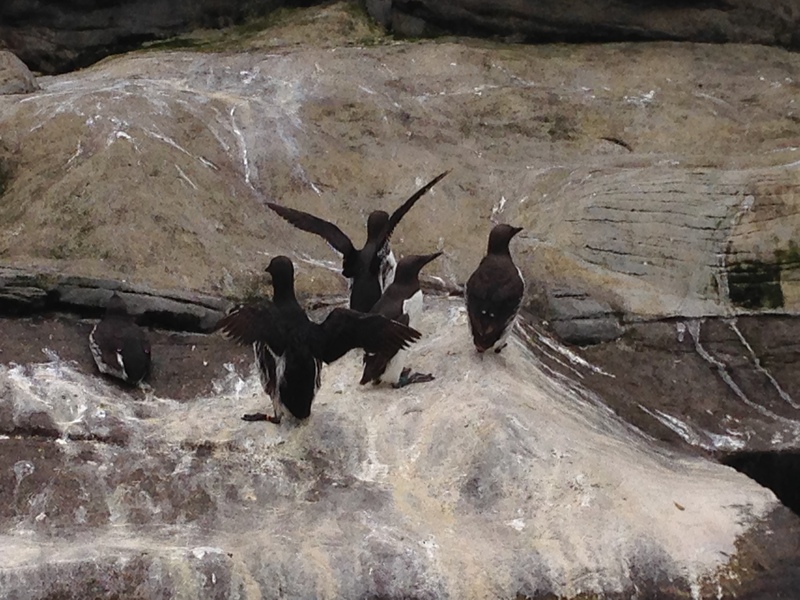 The Aquarium Village – fun for all. The call of the biking! Great to see you again!